Termidor is a new type of termite control that for over 5 years has faced the stiffest tests that both US and foreign researchers could throw at it. Without exception, Termidor passed with flying colors. In fact, no other termiticide in history has consistently returned ‘100% effective’ results whenever and wherever it was used. For you, ‘100% effective’ means that you can now choose a termiticide that not only eliminates termites from your home or business for at least the next 5 years. It also gives you 100% peace of mind. Termidor is non-repellent. Termites can’t smell it, see it or feel it. Since they don’t know it’s there, they forage freely in a treated area. The ‘100% effective’ results begin here. First, and like other leading liquid termiticides, Termidor is lethal to termites when they ingest it (since they don’t know it’s there, they ingest it readily). Second, and unlike all other termiticides, Termidor is lethal by contact. This means that termites don’t even have to ingest it to die from its effects. As well as eating Termidor, a termite will also unknowingly pick it up and carry it back to the colony on its body. 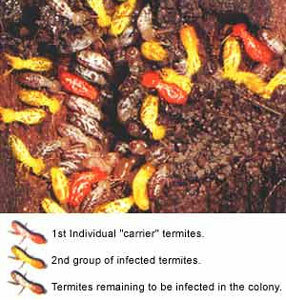 Thus, every other termite it contacts, feeds or grooms will itself become a carrier, contacting and infecting others. Bottom line, this means that you can count on at least 5 year’s worth of 100% termite protection when you choose Termidor. Termidor has changed the way we go about dealing with termites in all of Florida.